If you're planning a western-themed wedding, it's natural to extend this theme to your choice of wedding rings. There are lots of great choices on the market, ranging from a little bit country to full-on western style. No matter which type of design you're looking for, it helps to know where to shop. Cowboy Jewelers is a western-style jewelry store with a full line of handmade wedding rings. You'll find a wide range of materials and motifs, and many rings are custom made to your specifications. All rings are made in the United States. The rings at Cowboy Jewelers feature all the important western motifs, including horseshoes, stars, crosses, and more. You'll see designs in sterling silver and gold, some set with turquoise, cubic zirconia, and other gems. Prices range from about $300 to $800. The Sterling Silver Horseshoe Band features a center simulated ruby horseshoe flanked by two smaller gold-filled horseshoes, all mounted on sterling silver. It retails for about $330. 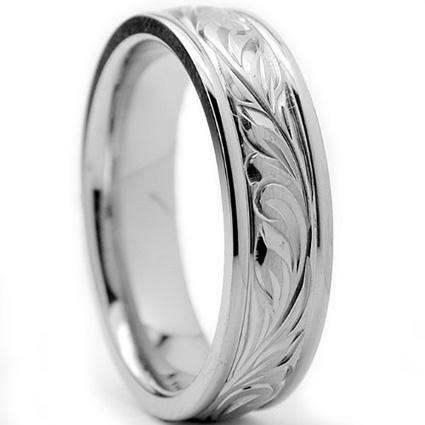 For a simpler choice, the Sterling Silver Hand Engraved Band is entirely made and engraved in the United States with a flowing western floral design. It sells for about $320. You can also contact Cowboy Jewelers to create a custom design. Cowboy Jewelers is based in Oklahoma, but they do not have a brick and mortar retail shop. They do all of their sales online. There are no customer reviews of this jewelry store available online, but they do have a Better Business Bureau rating of A+. Since wedding rings are custom made, they typically take between eight and 12 weeks to manufacture. Shipping is fast and rarely adds more than a week to the delivery time. They do not do rush orders. Cowboy Jewelers does not accept returns on wedding rings, since rings are made to order. They will re-size your ring for a fee, but they recommend that you confirm your ring size with a local jeweler before placing the order. Bennett Fine Jewelry specializes in equestrian jewelry and has a beautiful line of wedding bands. The jewelry designer, Lesley Rand Bennett, used one of the company's western wedding bands for her own ceremony. Wedding rings from Bennett Fine Jewelry are handcrafted out of heavyweight yellow or white gold. You can customize the designs by adding black enamel or diamonds. Prices vary based on customization, but you can expect to spend between $600 and $2,500. The Narrow Horseshoe Band is five millimeters wide and features a repeating pattern of horseshoes. If you add black enamel, this accents the horseshoe pattern. This band retails for just under $600 without enamel or diamonds. The Two Become One Horseshoe Wrap is a ladies' wedding ring designed to go around a simple diamond solitaire. 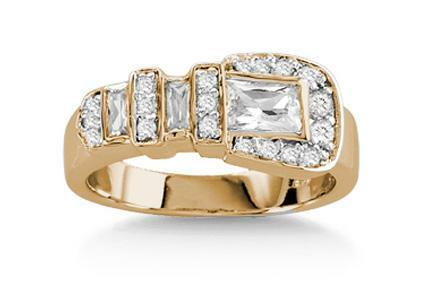 Available in white or yellow gold, it features a diamond horseshoe and retails for about $1,000. Bennett Fine Jewelry has a retail shop in Scottsdale, Arizona where you can see the entire line of wedding rings. You can also order any wedding ring through the website. Although this company doesn't have any consumer reviews or a listing in the Better Business Bureau, Lesley Rand Bennett is accredited by the Gemological Institute of America (GIA). Order processing is extremely fast. Bennett Fine Jewelry says that they ship orders the same day they receive them. Shipping is through UPS. The company does not publish its return policy, so if you're considering a wedding ring, it would be a good idea to contact Bennett Fine Jewelry to learn more. If you're still wondering which style is for you, viewing pictures of western wedding rings can help. No matter which ring you choose, this is the perfect way to make the country and western charm of your wedding day last for the rest of your life.